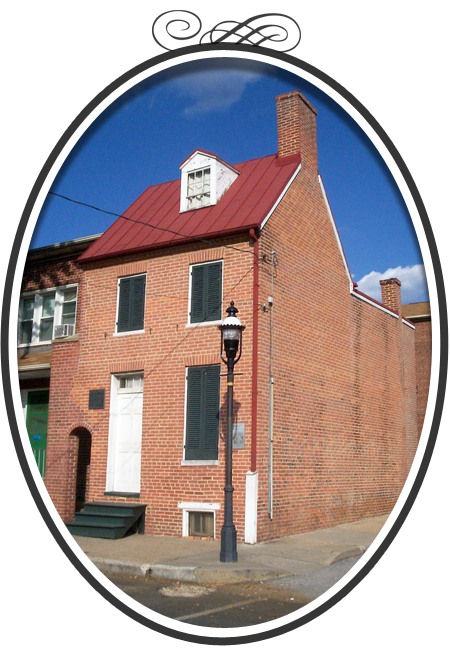 Please note that the Edgar Allan Poe House and Museum is open to the public every Thursday, Friday, Saturday, and Sunday (11am-4pm, last entry 3:40). There is a fee for admission. Follow Poe Baltimore on Facebook for updates on our schedule and events. As well, you can join our mailing list to be notified of special open weekends and events around town! The above photograph was taken around 1980, showing the Baltimore Poe House as it appears today. To the left is a row of houses erected in 1938 under the Housing Authority of the city of Baltimore. The second half of the duplex, which would have been on the left when Poe lived here, was removed during construction of these newer homes.